A first time jumper may feel overwhelmed at the thought of freefall; it's exciting, adventurous, and more than a little scary. Learning the proper terms of the trade is one of the best ways to get acquainted with skydiving. Whether you're going on your first tandem jump or you've done it a thousand times, here are five skydiving terms to help you make the jump out of airplanes more fun. 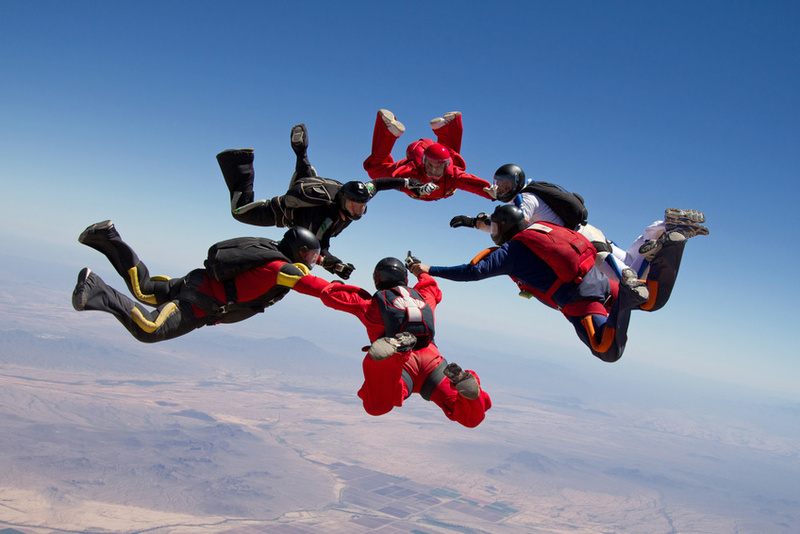 You won't be alone on your first time skydiving; in fact, you will take part in what is known as a tandem jump. During a tandem jump, the jumper is attached to the front of a trained professional to ensure you both freefall carefully to the ground. A tandem jump also means your instructor will be able to snap a few memorable pictures on the way down. You may often hear this phrase in some of your favorite action movies, but it's a commonly used phrase in the world of skydiving. Terminal velocity refers to the constant speed at which an object -- in this case the jumper -- will reach before resistance stops acceleration. In less technical terms, it means you physically can't go faster. A tandem freefall usually lasts around 45 seconds before the canopy is pulled, but some jumpers can reach a terminal velocity of up to 120 miles per hour! This is more than just your least-favorite vegetable. "The peas" refers to the spot where jumpers want to land for the best in accuracy. It's essentially a circle at your local skydiving center with a radius of only a few feet, so it's incredibly hard to hit. Landing in the peas gives you infinite bragging rights among skydivers new and old. It isn't a bubble, but it kind of sounds like one. A burble is a zone of turbulence that forms next to the jumper in freefall, usually over your back when you're facing toward the earth. You don't have to worry about the burble unless you're nearby another parachuting group. Should you get into someone's burble, you might crash into them from the turbulence. An AAD is a device that has revolutionized the safety of the parachuting industry. AAD stands for "automatic activation device," and it's a handy device nearby the reserve parachute. Should an accident or emergency occur during your freefall, the AAD will deploy the reserve parachute. This is essential should a jumper lose consciousness or if there's a failure in the canopy parachute. Jumping out of an airplane is one of the most thrilling experiences in your life. When you want to experience freefall, contact the best skydiving in Tampa: Jump Florida Skydiving.